Biomedical engineering concentrator Pooja Chandrashekar, A.B. '18, founded ProjectCSGIRLS, the nation's largest computer science competition for middle school girls. Pooja Chandrashekar was shocked to realize she was one of only three girls in the AP computer science course at her math and science-focused high school in northern Virginia. As she took more advanced classes, Chandrashekar was devastated to see female peers dropping computer science in droves. While still a high school sophomore, Chandrashekar decided to launch a coding competition exclusively for middle school girls. ProjectCSGIRLS challenged students to develop an idea that used technology to solve a social problem. The initial competition drew about 100 girls, each of whom brought tri-fold displays of their tech-focused ideas to a science fair at George Mason University. Buoyed by that success, Chandrashekar, now a biomedical engineering concentrator at the Harvard John A. Paulson School of Engineering and Applied Sciences, wasted no time broadening the program’s reach. She contacted friends and colleagues across the country for help expanding to a national level. At the same time, she retooled the contest to require students to code or prototype a computer science project under one of three socially-motivated themes: intelligent technology, a safer world, or global health. Chandrashekar and her team launched workshops at schools across the nation to help girls build the fundamental skills they would need to compete. At a two-day celebration in northern Virginia, 30 finalist teams attended lectures and workshops, presented final projects, and received awards at a glitzy gala held in a hotel ballroom. Now gearing up for its fifth iteration, the annual competition continues to draw girls of all backgrounds who tackle a wide range of topics. One finalist developed an app for Alzheimer’s patients that can identify a photo of a friend or relative using visual recognition. Another project enabled production of electricity from the kinetic energy generated by a driving car. Now the nation’s largest computer science competition for middle school girls, ProjectCSGIRLS reached more than 2,000 students in 40 states last year, in addition to thousands more through regional computer science workshops. This year, the program launched workshops in Canada, France, Germany, India, and Sri Lanka, and Chandrashekar has her sights set on even more nations in the future. She wants ProjectCSGIRLS to inspire and encourage as many girls as possible, in an effort to make computer science a more diverse field worldwide. Chandrashekar also initiated a ProjectCSGIRLS chapters program this year, enabling students in high school or college to launch a local chapter of the organization. Local chapters can take almost any form, from an afterschool club to a hackathon to a series of panels. The chapters build off of a rapidly growing network of ProjectCSGIRLS alumni who are inspired to share their passion for computer science with younger peers, she said. Now with chapters launching across the nation, and competitions underway around the world, Chandrashekar looks forward to seeing how her initiative will help inspire young women to become future leaders in technology. 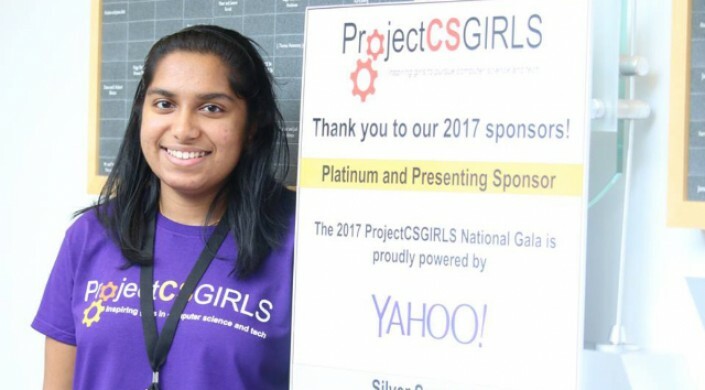 ProjectCSGIRLS, a 501(c)3 nonprofit organization, is sponsored by Yahoo, the Society for Science and the Public, Symantec, Northrop Grumman, and Kleiner Perkins Caufield Byers.